Click to view LucasArts plans to release new characters and a new single player campaign set in the Jedi Temple as downloadable content for Star Wars: The Force Unleashed in coming months, Force Unleashed executive producer Haden Blackman told Kotaku. The content will be coming to be the 360 and PS3 version of the game. No specific date or prices have yet been set for the downloadable content. In the coming months Lucas Arts will release a downloadable content pack featuring additional costumes and character models that can be used to play through the single-player campaign. The new models will include Luke Skywalker, Obi-Wan Kenobi, Ki-Adi-Mundi, and Kit Fisto. The skins we decided to release were "based on what we heard from fans," Blackman said. "But some were from us. We thought Ki-Adi-Mundi or Kiit Fisto would be exciting to see running around in our game." While the new skins simply give you a new way to play through the existing content, the new level will be played out on a beefy new map and includes quite a bit more plot.Due out later this year, the new single-player mission is set in the Jedi Temple on the planet Coruscant. Darth Vader's Secret Apprentice travels to the temple to learn more about his father, and while searching through the rubble of the destroyed building he confronts his inner demons. (SPOILER) The level seems to fit in nicely with a moment in the original game when the Apprentice comes face to face with the ghost of his father. I asked Blackman if that was done deliberately, or if that confrontation would be where players would jump off into the new adventure. "That was a scene we had written into the script to suggest that the apprentice was getting more into his background and in touch with his childhood," Blackman said. "It's in there to remind the player that the apprentice had come from a jedi father that he wasn't always evil. It coincides nicely with him beginning to question working for Vader." (END SPOILER) Blackman said the team talked about having that moment be the jumping off point for the new adventure, but in the end decided it wasn't feasible. "We wanted players to be able to access it immediately when they download it," he said. "So it's an added level. A separate campaign." The new campaign's map is smaller than The Force Unleashed giant level on the junk planet Raxis Prime, he said, but it's larger than Cloud City. "We hope it hits the sweet spot for size." This new location, which appears in a different form in both the PSP and PS2 versions of the game, was one of about eight that the teamed talked about including in the final game, but didn't make the cut for one reason or another. "We had a list of 20 locations in our exploration phase," he said. "Those got whittled down. Which ones were viable and which weren't. The temple hung on and hung on and hung on. We had to make cuts right before production and it was one of those." 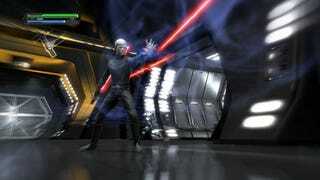 And Blackman said it's entirely possible that the internal development team working on this new DLC will continue to work on new episodes, that The Force Unleashed could essentially become a delivery system for episodic content. "We brainstormed a ton of locations," he said. "There's easily another two dozen we could make into levels. This is a good way to continue the story." "I wouldn't rule out any future content on The Force Unleashed." This new content also makes the game that much more replayable, something that could potentially help bump it from a rental to a purchase. "We hope gamers hold onto the game anyway," Blackman said. "There is already a lot of replayability built into it. There is quite a lot of exploration you can do. If you enjoy the story, the gameplay, the first time through, though, you should enjoy this."